The first resume was conceived by Leonardo Da Vinci in 1481 and he made it mandatory for prospective candidates wanting to join his workshop as an apprentice. It was his method of screening candidates before he discussed with them. Now fast-forward to 2018 – that’s literally 538 years – and Recruiters still use resumes for primary screening. Ironically, even in the digital age, candidate screening has become more challenging. A 2-year research that our company conducted revealed that it takes a minimum of 90 days (3 months) from the moment a position is advertised to the time when a candidate accepts the offer letter. The elaborate insights we gathered on why hiring and job search are a pain can be found here. 90% of this time-to-hire is taken up by candidate screening. In other words, 80 days are exhausted in filtering qualitative candidates for successive interview rounds. Why is this so? Because Resumes were the culprit! 1. People lie a lot in resumes: The agonies of job search needs no justification. Candidates want to get over it as soon as possible, and edit their resumes in manner that it syncs with a lot of key words disclosed in the job description. This can be a nightmare for recruiters in shortlisting candidates for successive interview rounds because they can’t gauge the latter’s strengths or weaknesses qualitatively. 2. No standardized format for resumes: One would imagine that since 538 years of resume’s inception, recruiters all over would have standardized a format for resumes. There are fresher resumes with 4 pages and single-paged resumes of experienced candidates. 3. Even applicant tracking systems (ATS) can be surpassed: Our research revealed that certain candidates copy/paste few exact sentences from job description into their resumes in white font. While the tracking system reads it as an exact match to the job description and shortlists the candidate, the recruiters are not able to “view” hidden texts. This is an unfair “hack” by which unqualified candidates surpass qualified ones. ATS can quantitatively optimise data, but never the quality. It can never rule out resume hackers. 4. Even artificial intelligent (AI) systems can be fooled: Many AI systems claim to use unique algorithms to shortlist qualitative candidates. These include assessing writing skills based on how the candidate has structured his/her sentences in the resume, and judge merits of their experience based on project-specific time frames. But what if some candidate got his/her resumes written by a professional writer? What if they lied about managing a 200-member team when they actually managed only 50? What if these candidates were shortlisted for successive rounds before the truth was found? By this time, genuine candidates would be ignored. Moreover, many AI systems have been shut because they discriminated against gender and race irrespective of qualifications based on resume inputs. 5. A resume is never complete: There are many elements that determine a qualitative recruitment beyond education and experience. Certain positions – like sales or marketing – requires unique personality type to do the job well as opposed to qualification. These can’t be found in resumes. The passion component is also missing on the resumes. For example, research indicates that people who play music instruments adept for positions in market research. A resume will never indicate these intricacies. When it comes to qualitative recruitment, one can’t ignore the humanizing element. A common trait among the most successful recruiters – apart from ignoring resumes – were their ability to connect with people, with a genuine intent on getting to know the candidates better, beyond just qualifications. While this may take more time, it has cemented their stance in recruiting the best workforce. Unless resumes are eliminated, bias and confusion can’t be ruled out. 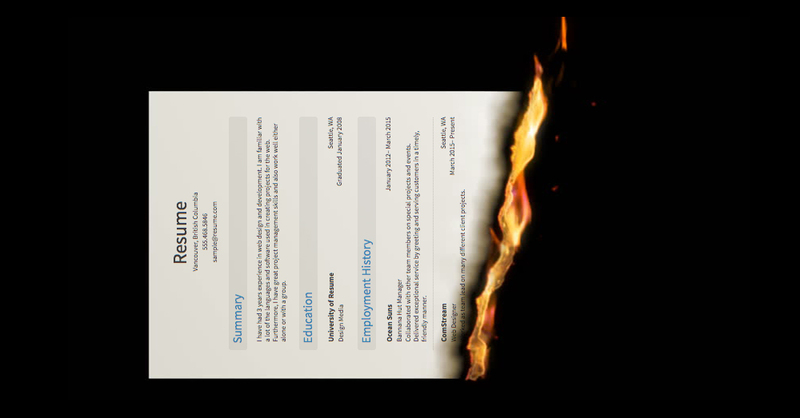 It’s about time we let the resume die and empower the humanizing element in recruitment.